Yale’s YRC216-ZW2-OBP gives you the ability to lock and unlock the door remotely so you never have to question if you left the door open again. The smooth weather resistant design makes it excellent for handling Canadian winters and other elements. The YRC216 is Zwave plus certified and Grade 2 certified so you know it's built tough. Using the Yale Accentra Cloud-Based software, you can manage access for residents, guests or staff with ease from anywhere using a compatible Windows, Apple or Android device. Distribute up to 25 pins to visitors and grant new ones in the event of a relative forgetting theirs. When integrated with a Z-Wave or Zigbee system, this capability can be expanded up to 250 pin codes. Installation is simple and takes only minutes with the use of a screwdriver so you can do it yourself without calling for a professional to install your lock. 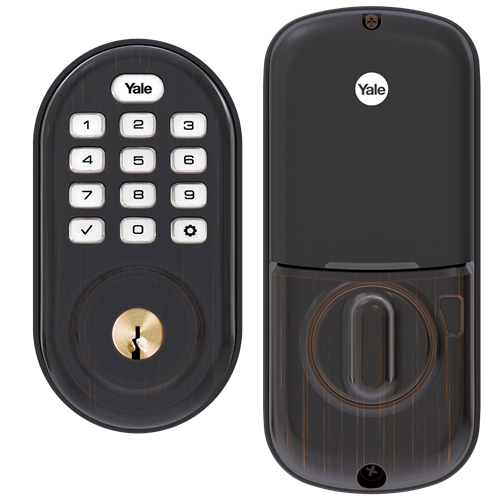 The lock features a rubber gasket which aids in protecting your door as well as shielding the lock itself from the elements. The acrylic push button keypad comes with backlit numbers so you don’t have to worry about visibility in the dark. Door Thickness 1 3/8” – 1 3/4"